Tables ring Prescott Field at the Job and Internship Fair on Thursday at GCU. The tables started where they usually do, at the front entrance of the Grand Canyon University campus, and stretched all the way up the Promenade to the Student Union. Nothing unusual there. The Job and Internship Fair is always a big draw – the highlight of Career Week. But then they kept going. Down Lopes Way. A right turn down the walkway east of Prescott Field. And all the way down to the south end of the field, where representatives from school districts, private schools and other education companies were stationed. Thursday’s job fair was the biggest the Career IMPACT Center has ever put on – 236 companies from the business sector, 70 from education. They showed up in droves, and the students did, too. It was rare to find a table that wasn’t busy with multiple conversations. Matsuda knows his job fairs, and he especially knows what he’s getting with GCU students. 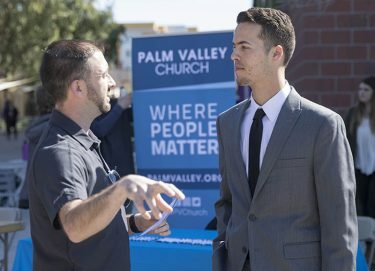 This was his eighth GCU job fair, and he keeps coming back because of the types of applicants he gets for a job where trustworthiness is No. 1 on the list of qualifications. Same goes for Jennifer McGovern, Manager of Talent Acquisition and Retention for the Arizona Diamondbacks. Not only did she come to the job fair; she also participated in the Resume Review/Mock Interview session conducted by the Career IMPACT Center the previous day. “I love meeting the students,” she said. “They’re honest, they’re educated, they come with good questions, they come prepared with research. It’s a privilege to speak with them and help them achieve success. 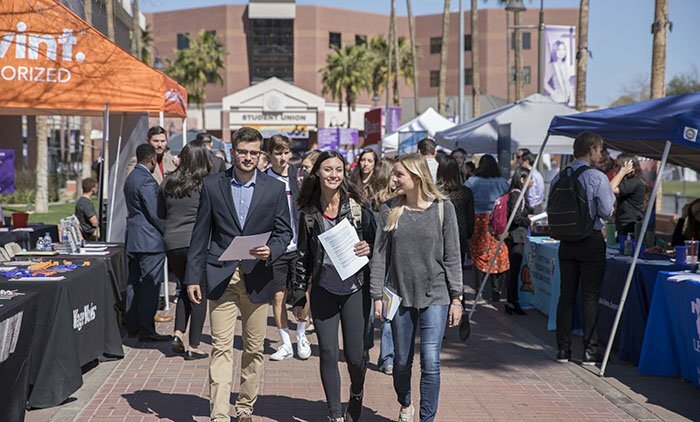 It also proved worthwhile for the education representatives, joining the fair as a group for the first time because it was combined with the College of Education’s Lopes Leap to Teach. “We always had school districts here, but it wasn’t a concerted effort,” said Jacqueline Smith, Executive Director of the Career IMPACT Center. The extra effort was appreciated by those attending. A side benefit is visits from graduates of the school districts who are now GCU students, and that also happens with the private companies. In some cases, the recruiters are GCU graduates. Prominent at the Primerica table was Ashley Hardin, a 2009 grad who worked for the University for six years and now is a successful financial advisor who regularly conducts sessions at GCU’s Money Week in the fall. She emphasized how important it is for students to take advantage of the job fair, especially if they are unsure about their career path. “It helps them in multiple ways – not only with networking and helping them have that general conversation, but also in giving them an idea of what’s available,” she said. Stefan Marin is thankful that he found USAA, which he first noticed at the job fair. Then there’s the story of Stefan Marin, who graduated in 2015 with a degree in English literature but wound up working as an auto claims representative for USAA. No, USAA isn’t looking for people who know Shakespeare, but it certainly knows GCU students – Marin said two of them were in the insurance company’s internship program last year. 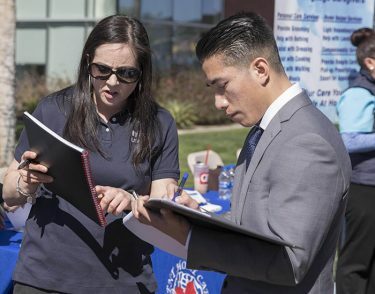 The way Marin found USAA speaks volumes about why job fairs are so important. 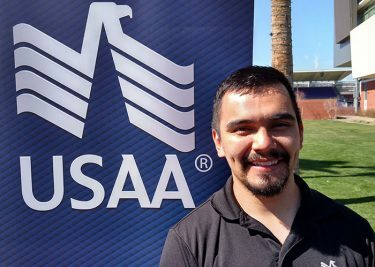 He learned a little about the company at a GCU event, and his interest was piqued even more when a USAA employee came into a store he was working at and said good things about the company. 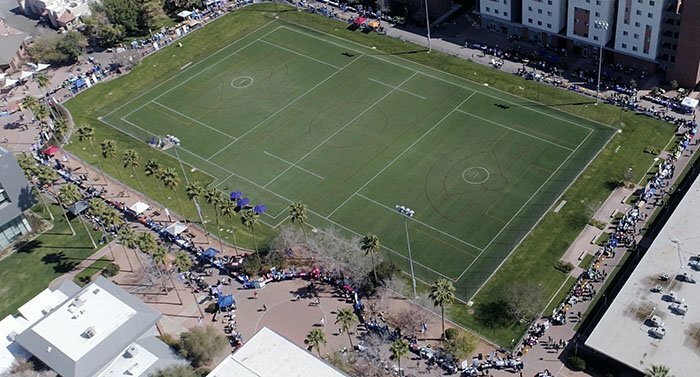 Marin even found that the transition from GCU’s modern campus to the USAA facility in north Phoenix was smooth because of their similarities. Weather certainly wasn’t an issue Thursday, not with the temperature flirting with 70 under clear skies. It was a perfect day for finding a job or an internship — and there were more than 300 choices. “It’s an easy conversation to invite employers to our event because they all want to hire our students,” said Alexa Wennet, who handles Employer Outreach for the Career IMPACT Center and spearheads the job fair. The conversations continued Thursday at table after table. Here, there, everywhere … the possibilities were everywhere for both companies and students. Just about as far as you could see.